The June 2018 Hellcat of the Month as picked by the members of the SRT Hellcat and Demon Facebook Group is the 2017 Dodge Charger SRT Hellcat shown above, owned by Chris Fuelling. Over the course of the past two years, TorqueNews has worked with the members of the SRT Hellcat & Demon Group on Facebook to choose the Hellcat of the Month. The members – numbering more than 17,400 strong – are asked to nominate five Hellcat cars that are owned by active members of the online community. Once those five Hellcat cars are chosen, the members are asked to vote on their favorite car of the five in the running. In the June Hellcat of the Month nominations, we focused on the Dodge Charger SRT Hellcat and of the five supercharged sedans chosen by the community – Chris Fuelling’s white and black Mopar muscle machine was picked as the winner. Fuelling’s Charger pulled down 49% of the votes, beating second place by a margin of better than two-to-one (23%). 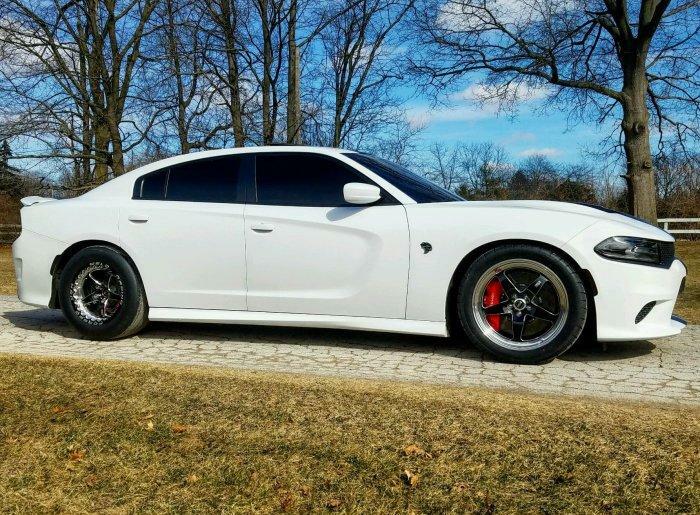 After the group picked Chris Fuelling’s Dodge Charger SRT Hellcat as their favorite for the month of June, we reached out to him to get more info on his beastly sedan. Below is his story. I ordered the car brand new in 2017 and I received the car March of that year. I got the car because my dad ordered his Challenger Hellcat in 2015 and I just couldn’t get over how fast and well put together [the Hellcat cars] are. I went with the Charger because I have 2 children that are just as obsessed with cars as me so it was a no brainer. During the summer of 2017, I added a 2.85 upper pulley, a Legmaker intake and JBA midpipes. It made 780 wheel horsepower and that was fun, but I wanted more. In December of 2017 I took the car to Injected Engineering and did a 2.5 upper pulley, id1300s injectors, an upgraded fuel system, an E85 tune and a trans tune. With this setup, the car made 903 horsepower and 848 lb-ft of torque at the rear wheels. The car is currently getting a Paramount transmission to handle all of that power and eventually it will have a stroker and a 4.9 Kenne Bell supercharger setup. So, from everyone at TorqueNews and the Hellcat & Demon Group Facebook page, congratulations to Chris Fuelling and his Dodge Charger SRT Hellcat for being the Hellcat of the Month for June 2018. If you own a Hellcat Challenger or Charger, or you are waiting on a new Dodge Demon or Jeep Trackhawk, and you want to get involved, click here to join the Hellcat Group Facebook page!